Masks are highly valued by the Kwakiutl, serving as potent manifestations of ancestral spirits and supernatural beings and offering these supernatural entities temporary embodiment and communication through dance and other kinds of performance (Greenville 1998: 14). Masks also allow the wearer to undergo spiritual and social renewal, and serve as an outward manifestation of inward transformations (Pollock 1995: 588-590). However, Northwest Coast tribes do not all share the same myths or characters, nor do they necessarily use masks in the same way during their ceremonies (Malin 1978: 47). Each mask and accompanying dance are owned by particular families and passed down by elders and chiefs to their immediate and extended families to be used in ceremonies like the potlatch and seasonal festivals. 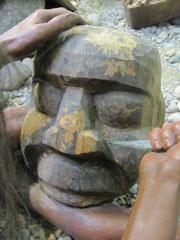 These masks thus accumulate histories that transform and enhance their value (Gosden and Marshall 1999: 172). Oftentimes, people who specialize in carving are commissioned to make these masks several months, even years, in advance for members of the Kwakiutl First Nation as well as for museums and private collectors (Malin 1978:18-19; Ostrowitz and Jonaitis 1991: 251). Archaeological evidence for the antiquity of mask-making on the Northwest Coast is scarce, though it is clear that a distinctive Northwest Coast cultural pattern and artistic style emerged over a thousand years ago (Kehoe 1992: 434; Malin 1999: 17). In the late eighteenth through early twentieth centuries, European explorers noted the significance of masks and totem poles to the native communities they encountered on their journeys. Their observations are supported by the masks and other materials they collected and documented while on these expeditions (Siebert and Forman 1967: 9-16). The ceremonial function and significance of masks for the Kwakiutl seems to have changed significantly as a result of colonization and Christianization over the last century and a half. The style and form of masks changed in tandem with access to iron tools and supplies made available after contact with early Russian explorers and European settlers (Holm 1965: 5; Malin 1978: 13; Jonaitis 1991: 39, 54; Masco 1995: 42). Access to modern equipment and supplies was later increased with the establishment of companies like the Northwest Company and the Hudson Bay Trading Company, which built a trading post near Fort Rupert, BC in 1849. Buttons and foreign fabrics purchased at the Trading Company were quickly implemented into traditional Kwakiutl crafts and regalia, enhancing their prestige. Metal carving tools were sharper and more efficient than their traditional counterparts, and modern synthetic paints allowed for more dramatic and durable coloration than did the plant and mineral based pigments previously used to decorate masks (Jonaitis 1991: 39, 54). 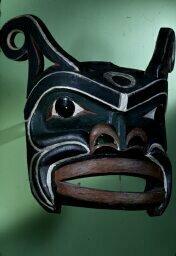 Innovation and adaptation are important parts of the Kwakiutl tradition of mask making. However, modern art markets and museums, which have tended to place great value on contemporary masks that replicate the style of earlier historic masks, have made it difficult for many native artists of the region to freely experiment with their craft. This is in sharp contrast to the kind of experimentation that is normally expected in the work of non-native Western artists (Ostrowitz 1999: 107-108). The influence of earlier generations of carvers like Willie Seaweed, Charlie James, Mungo Martin, Henry Hunt, Bob Harris, Ellen Neel, and Arthur Shaughnessy continues, therefore, to be evident in the works of contemporary Kwakiutl artists and the generation of new carvers they have already begun to train. Well aware of their critics, museums have begun to foster a climate of appreciation for greater innovation and originality among native artists, recognizing artists’ right to define the limits of their own creativity and connection with the past. At the same time, the significance of early historic masks should not be underestimated for, as with all artistic traditions, they have provided the foundation upon which contemporary Kwakiutl artists now stand. 2. For discussions on cultural change in Kwakiutl communities, see Irving Goldman’s The Mouth of Heaven (1975) and Stanley Walen’s Feasting with Cannibals (1982). Moveable dorsal and pectoral fins and tail. Whale masks are typically quite large and are usually worn over the dancer's back, freeing the dancer's hands to pull strings that would cause the fins and tail to move. 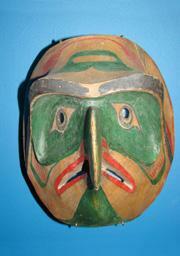 Killer whale masks like this one are typically danced at the Tta'sata ceremony and are associated with great wealth and clan ancestors, or may represent servants of the sea god, Kumugwe. 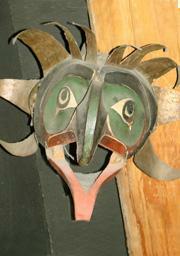 This mask appears to be a Crooked Beak of Heaven mask, owing to the flared beak and nostrils and its cedar bark mane. 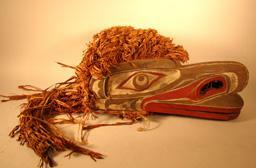 For more on Crooked Beak of Heaven, see the section entitled "Kwakiutl Cosmology". Hinged lower lip and shell inlay on forehead. 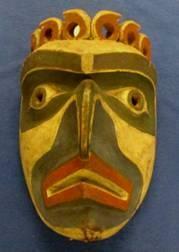 The inlay on the mask's forehead may indicate that it is a specific sea monster known as 'Namxxelagiyu'. Hinged jaw. 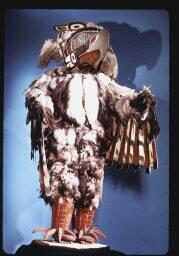 For more on the Thunderbird, see the section entitled "Kwakiutl Cosmology".